See one of the most awe-inspiring natural wonders of the world on this extremely fun two-day Niagara Falls, USA Getaway! Prospect Point - Welcome to Prospect Point State Park, the best place to observe all three of the Niagara Falls with unobstructed views, immersive experiences, and informative tours! Just East of the Falls, you can watch the upper Niagara River Rapids approaching the brink, then watch as the river drops 50 feet for a half mile before reaching the crest of the American Falls. Stand within inches of the American Falls, with Horseshoe Falls as your backdrop from the bottom of Prospect Point, or catch the best-unobstructed views of all three falls at once from the top of the Prospect Point Observation Tower. This amazing piece of architecture extends out dramatically over the Niagara Gorge, and below the tower, you can get a multi-sensory view at the stairs to the Crow’s Nest providing you with the loud sounds and misty spray of the falls just feet away from you! Visitor Center - There are a couple of different options when it comes to your Niagara Falls Visitor Center experience, with two choices for best warm welcome to the area. The first option is One Niagara, the Niagara Welcome Center a tourism and sightseeing haven perched within very close proximity of the falls and provides information about everything you'd need to know as a visitor plus almost unbelievable photo opportunities just steps away from Rainbow Bridge. The other, equally informative option, is the Niagara USA Official Visitor Center, located down the road at 10 Rainbow Blvd. This center is the official Niagara Tourism center and is located in the very heart of the downtown Niagara Falls district, boasting helpful information, free parking, and even free WiFi! Niagara Adventure Theater - Welcome to Niagara’s iconic waterfall exploration-on-screen, the Niagara Adventure Theater. This local stadium-style theater provides guests with a 45-foot screen, as well as a 45-minute movie experience all about the falls. As the brilliant minds behind the theater itself say, this is the perfect opportunity for your group to "see behind the mist, myths, and mysteries of the most storied natural wonder of the world." Over 14 million visitors have sat in these seats and been adventure daredevils, all from the air-conditioned comfort of the theater, which is located on the bottom floor of the Niagara Falls State Park Visitor Center. Grab the Niagara USA Discovery Pass for the ultimate cash saving experience including six total stops (this one included), take advantage of the tri-lingual movie headset options, or even enjoy the half-hour new Legends of Adventure film! Maid of the Mist Boat Tour - The iconic Maid of Mist Boat Tour is an epic journey into the basin of the Niagara Falls State Park, Horseshoe Falls Basin, and surrounding falls. The entire experience is oftentimes the highlight of many visitors' Niagara Falls trips. This tour has over 150 years of experience and knows the best way to let guests "explore the roar," most people walking away with a completely new appreciation for the power and majesty of the Niagara Falls. 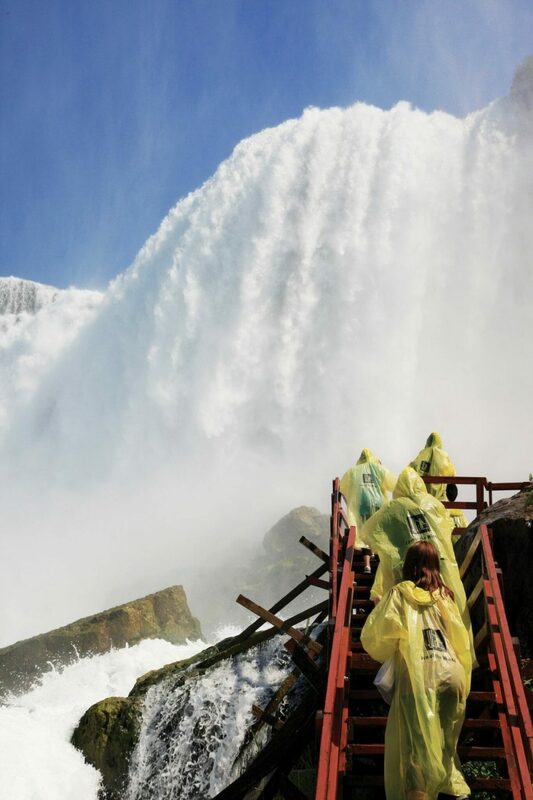 Start your trek at the base of the Observation Tower, then don a rain poncho and board the double-deck Maid of Mist boat for a dramatic passage past the American Falls base to Horseshoe Basin. Enjoy a truly memorable experience as you traverse the waterfall whitewater and interesting natural rock formations surrounding, not to mention observe the amazing vistas available from the deck of the boat. This is another attraction in which getting the Discovery Pass would be wise to save some money! Niagara Scenic Trolley - The Niagara Falls Scenic Trolley is an amazing transportation and tour guide tool that your group should utilize while visiting Niagara Falls State Park or the surrounding area. This vintage style trolley is the absolute best way to get around, being both super fun and super convenient. Get a detailed overview of the park during a guided ride over the route's total of three miles full of fun facts, history, and top attraction tips. The great thing about the Niagara Falls Scenic Trolley is that while you can ride along the entire route and fill up on all the fun facts, you can choose to jump off at any of the several stops and explore your surroundings at your own pace. Once you’ve seen the sights at one spot, look around and hop back on another trolley! Aquarium of Niagara - Welcome to the Aquarium of Niagara, a privately owned and highly popular Niagara attraction founded in 1965. Today this same group works to raise public awareness on various aquatic ecosystems through several innovative and stimulating exhibits, displays, and educational (even recreational) programs. You and your group will enjoy this, the first inland oceanarium, with exhibits involving things such as Peruvian penguins, harbor seals, tidal pool inhabitants, and even sharks. Enjoy sea lion shows, shark feedings, and interactive play sessions with the animals that allow you to learn so much about these marine mammals. See local Great Lakes residents, such as the piranha, sturgeon, and other local creatures before heading over to the "Fin-Esse" onsite gift shop for any essential educational souvenirs! Niagara Gorge Discovery - The Niagara Gorge Discovery Center just north of the Rainbow Bridge showcases the natural and local history of the magnificent Falls and stunning Niagara Gorge. Familiarize yourselves with the fascinating geology of the area and learn all about the Great Gorge Route trolley line. Embark on a cool virtual elevator trip and enjoy a 180-degree multi-screen theater presentation detailing how the mighty Niagara River carved the massive gorge and iconic falls over the course of more than 12,000 years, a process that continues today! The Discovery Center is also home to the Niagara Gorge Trailhead Center, the gateway to some of the best and most scenic hiking and biking trails in the region. Energetic visitors can access various popular trails from the trailhead building. Guided adventures like the Great Gorge scenic Overlook Hike, the Whirlpool Rapids Adventure Hike, and the Upper Great Gorge Hike are offered in the summer. Three Sisters Island - Three Sisters Island, a set of four separate islands, is a scenic conglomerate of landforms adjacent to the west shore of Niagara’s Goat Island. The name, Three Sisters, came from the story of the three daughters of General Parkhurst Whitney, an American Commander during the War of 1812. This commander's three daughters, Asenath, Angeline, and Celinda Eliza, were the first to visit the islands, made possible during their trek via an ice path. Upon discovery of this last island, the commander insisted that they are named after his girls and his infant son, making the fourth island, Little Brother Island. While here you will learn all about the history of General Parkhurst and his family, as well as his local influence in the ownership of the famous Cataract Hotel. Enjoy one of the greatest views of the upper rapids of the falls before they cascade of the Canadian Horseshoe Falls, as well as great trails, green space, and even gulls! Cave of Winds - Put your adventure pants on and get ready for the wildest Niagara experience, a visit to the one and only Cave of Winds. This natural cave is located directly behind Bridal Veil Falls, the closest point you can get to the falls! This cave was discovered in 1834, at the time named Aeolus’ Cave, Greek for the "God of Winds." The cave itself is 130 feet high, 100 feet wide, and 30 feet deep. The thrilling walk you will take to get to the cave is almost worth the whole trip, a slippery trek into the tropical storm like conditions right behind the falls. Don your very own souvenir rain poncho and specially designed slip-resistant sandals and take your very own wild adventure into the stormy mist zone, the perfect place to "soak it all up," literally!